The Neo Geo was a rather unorthodox beast – with an enormously steep asking price, it was marketed by developers SNK as a luxury console which ran sprite based games with incredible smoothness. Unfortunately, this was the era of the Nintendo 64 and Playstation (1) and most players were too wowed by basic 3D polygons to take any interest. That’s not where the oddness ends however: this console was the exact middle ground between arcade cabinet and home console technology, meaning most games were designed to be played in the living room, but could also be tuned to devour spare change at the local arcade. On the one hand it really did mean that this was a premium product; even the home version of the console shipped with an arcade stick and four heavy duty buttons, which was perfect for the eclectic catalogue of fighters, shooters and sports games that found their home on the platform. On the other hand it meant that most of the games that were released on the console ended up being quite shallow, as arcade games were generally more interested in getting players to drop more coins in them than they were about providing epic, in-depth experiences. Still, the console has a fond place in the hearts of many, and with the Switch launch, we are seeing a lot of ports of the finest Neo Geo games come to our devices for gaming on the go. So, the question then becomes; which of them are best worth playing? 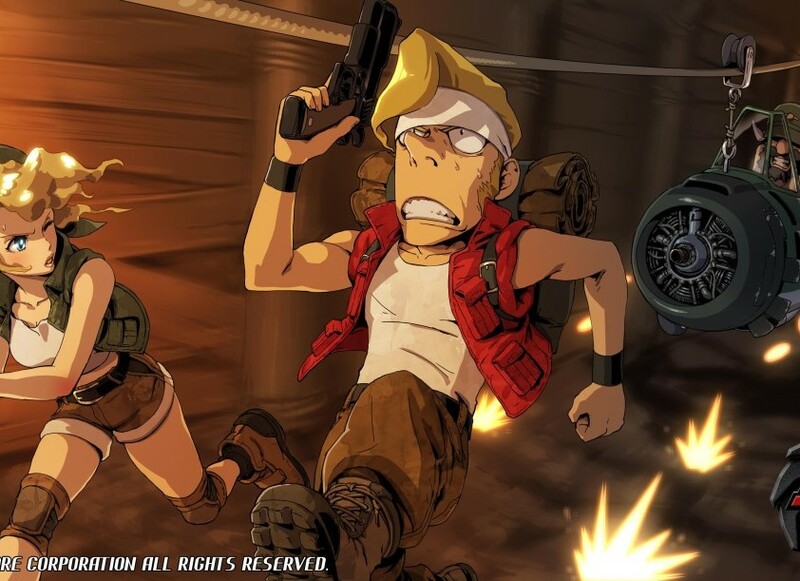 Widely regarded as one of the best run ‘n gun games ever made, and a strong contender for the best game on the Neo Geo, Metal Slug 3 has seen re-release onto nearly every platform since its debut in 2000. 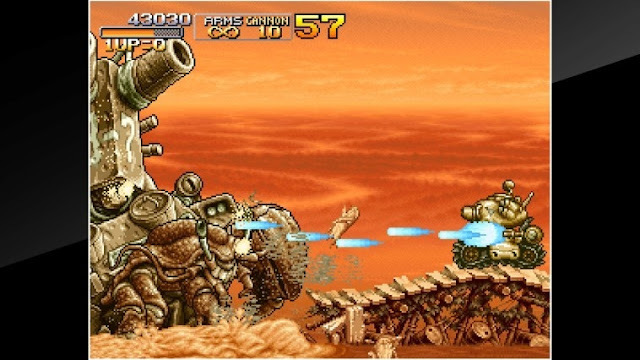 Building upon the franchise roots of fast action and zany storylines, Metal Slug 3 challenges players to run and shoot through warzones, zombie apocalypses and deep sea trenches in an all-out rampage. The Switch version of Metal Slug 3 is excellent, but not the best. Controls feel natural in any scheme, and being able to map the buttons of the Joy-Cons is a nice bonus. Auto-firing the pistol is difficult, however, as the small buttons on the controllers can’t be pressed too quickly without discomfort. The sprite graphics look fantastic both on the small and big screens – the Metal Slug series has always been known for its smooth, lavish sprites and even to this day there are few games which could match the sheer complexity of its visual effects. These sprites do take a toll on performance however – since the Switch version is a port of the original AES release, frame skips which would have occurred on the original hardware occur here too. If this might become an issue for you, it’ll be best to look for a remastered version of the game instead. The game’s difficulty level also strays on the balanced side for most Neo Geo titles. It’s definitely hard, but with enough dexterity all enemy and boss attack patterns can be avoided in some way. Its gameplay is easy to understand, and it’s a lot more fun when shared. An average run from beginning to end will put you at roughly two hours, but the game’s branching paths and overall energetic pace mean that this is a title you’ll want to come back to over and over again. Back in the heyday of the arcades, there was always that cabinet which was brighter, louder and had rowdier people crowded around it. Shock Troopers was that game then, and it remains that game now. This is a top-down shooter where if there aren’t multiple explosions going off on your screen, you’re playing it wrong. The game’s bright visual aesthetic and pounding soundtrack add to the power fantasy – this is a game sure to get you hyped up. Players choose from one of eight obnoxiously American characters and shoot their way through a variety of exotic environments. The levels are well designed, guiding players into setpiece moments and tough gauntlets which will test their ability to aim, shoot and dodge. Since this isn’t a twin stick shooter, you’ll be forced to shoot in the direction your facing – it’s an unintuitive design which will require some skill to get used to. Unfortunately, the game’s high difficulty and unavoidable bullet patterns make it a hard sell for modern players. The game’s multiple pathways and variety of characters don’t hide the extremely simple gameplay at the core – gameplay which wears thin after a few too many cheap deaths. Unless you’ve got a nostalgic soft spot for this one, you won’t miss out on much by avoiding it. 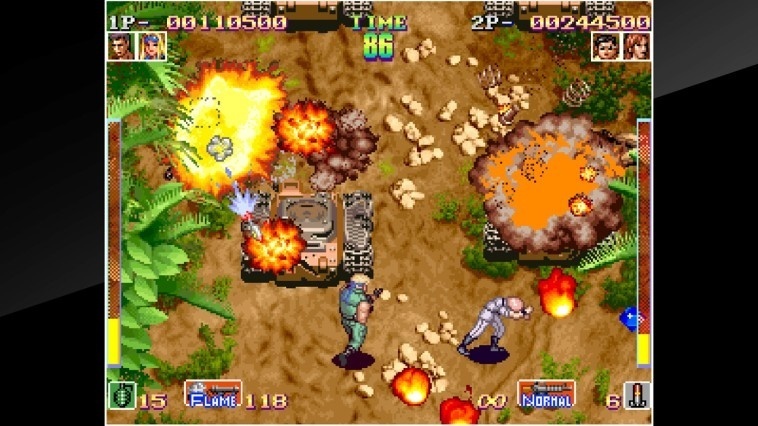 NAM-1975 is chronologically the first Neo Geo game, and it shows. It’s a gallery shooter in the vein of Wild Guns where the player character in the foreground must shoot waves after waves of enemies in the background. Despite being set in the very un-funny Vietnam War, NAM-1975 boasts one of the campiest stories available on the system, taking an Apocalypse Now-esque framing device and adding mechs, double agents and other B-movie fare. The biggest compliment I can give to NAM-1975 is that it’s an exceptionally smooth game. The left stick controls the targeting reticule, whilst the right face buttons control shooting and strafing. A fired bullet moves slowly towards the location the reticule was while the button was pressed – this slight amount of lag adds depth to the aiming system and forces players to be economical about which targets they pick. 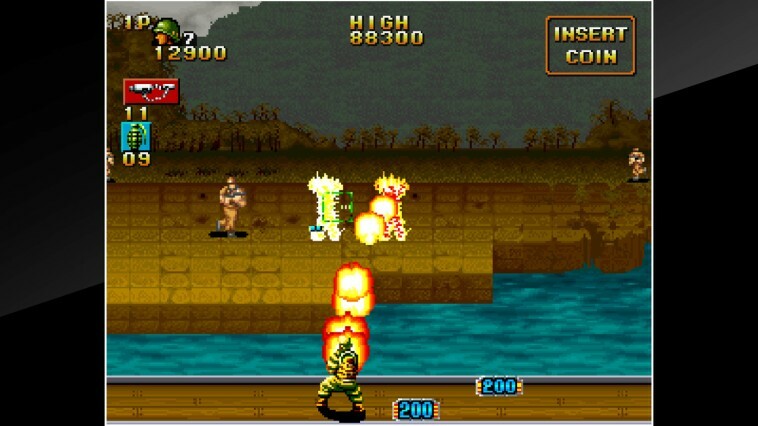 While the player is laying down the heavy fire, enemies will respond in kind. Hostile gunfire must be dodged either by strafing to the side, or by cartwheeling. You’ll always be aiming, strafing, and shooting, and the aim/dodge mechanics will ensure that skilled players can complete the entire game on a single 'coin'. This isn’t an exceptionally long game and doesn’t feature branching pathways or character selection like other Neo Geo games do, but it has deceptively simple mechanics that will have you playing over and over in an attempt to beat entire levels on one life. Players willing to look past the poor spritework and short runtime will find a fun arcade gallery shooter which otherwise might have been lost to history. I guarantee this isn’t a game you’ve played before, unless you spent some time in Japanese arcades in the late 90’s. Developed by Sunsoft, Waku Waku 7 released at the height of the 2D fighting game craze and served as a lighthearted alternative to the more mainstream offerings. The story revolves around seven crystals which, when gathered together, allow the owner to be granted a wish. The narrative feels like it’s been ripped straight out of the pages of a shonen manga – it’s energetic, idealistic and a delight to experience. This game’s fighters are designed with dynamic and novel attack patterns – think something like Skullgirls rather than Street Fighter. Each individual move reveals something about your chosen character’s personality while interacting with your opponent’s movesets. Since the character roster is so small, balancing is impeccable and the is no one character who rises or falls too far away from the others. The sheer weirdness of some of the characters will sure be a draw, but fans of the fighting genre will also find deep mechanics here. Don’t let the small character roster fool you – Waku Waku 7 was one of the best fighting games on the Neo Geo, and western Switch owners are lucky to have the chance to try this one out. 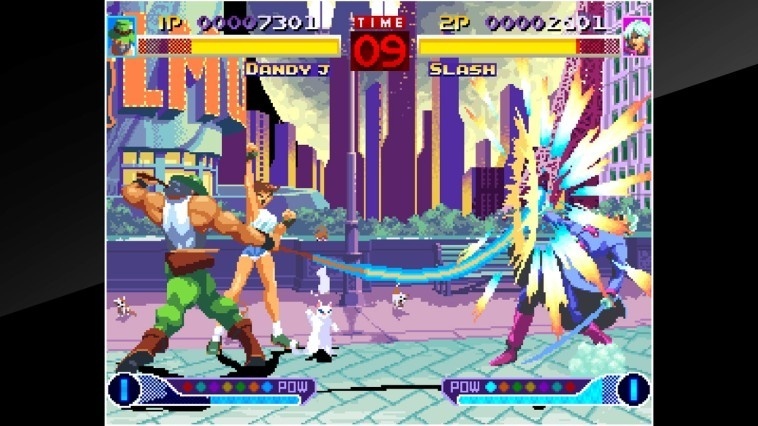 The game’s pastel colour scheme and gently paced gameplay is a breath of fresh air compared to the tournament minded design of King of Fighters or World Heroes Perfect. Fans of fighting games would be giving themselves a disservice to overlook Waku Waku 7. If you've ever wanted to see just how terrifying Rasputin could be, play this game and look forward to his Marilyn Munroe-inspired victory pose as his gown is blown up from a breeze. That'll blind you, it will. World Heroes Perfect is a fighting game that brings together a number of characters from history to brawl it out over who is the greatest historical warrior of them all. In buying this game you get everything that you would expect from a Neo Geo fighting game; detailed sprites, slick animation, and tight controls. What you won't get is much personality or balance. The game undersells its "real people from history" basis; indeed, some of them I didn't even recognise at first. Their fighting styles are only vaguely reminscient of their real-world personalities, too, which is disappointing (aside from the special attacks, that are spot on). More critically, there are some characters with spammy attacks that make the game far too easy, and other characters that are next to useless. Given that the game already has a small roster, this doesn't do much to help its long term value. 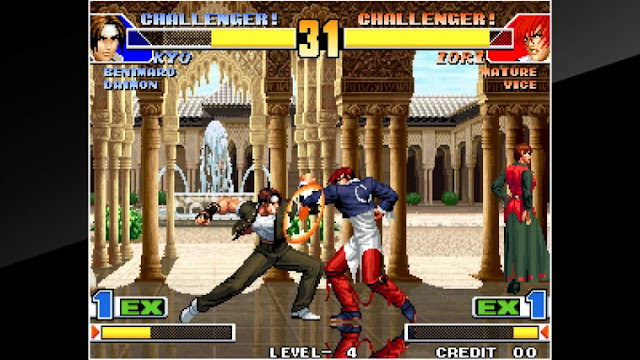 Often considered one of the strongest iterations of the long running franchise, King of Fighters ’98 is a celebration of the series so far, featuring nearly every single character as playable and perfecting the mechanics and balance of previous titles. KOF ’98 boasts over thirty playable characters – an impressive feat for its context – and manages to make each character feel unique in terms of both gameplay and personality. 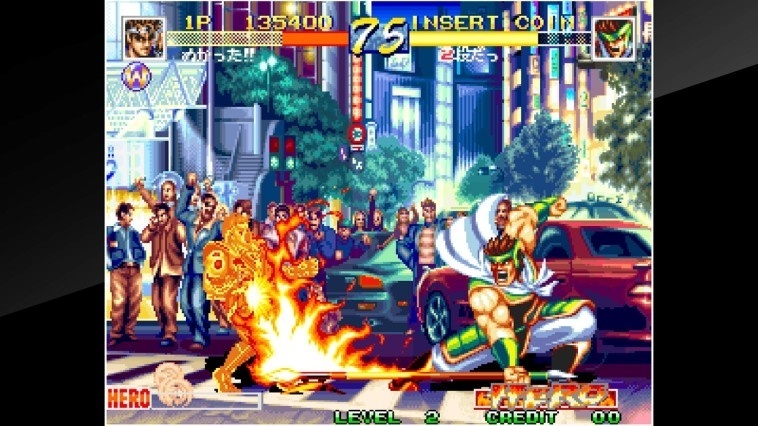 The King of Fighters series is known for being one of the more strategic variants of the fighting genre. Matches are 3 on 3, meaning that players will need to familiarise themselves with three characters, and will be able to plan out matchups beforehand to tilt the odds in their favour. This encourages players to scour through the enormous roster to find a few characters they enjoy playing. If there is one complaint to be made however, it’s that the game does not have a compelling story to go with its action. KOF 98 is effectively non-canon: characters which died in previous games return here because they’re a blast to play, and this means that gamers new to the franchise won’t be able to experience the series’ penchant storytelling and characterisation. If you’re here for the fighting however, you’re in luck. King of Fighters 98 is one of the most robust 2D fighters ever made. Game balance is impeccable, and each character has a solid amount of offensive and defensive options to make them viable. Matches are decided entirely upon skill, so this game is best experienced with a few friends who are willing to learn the strategies and get good enough to compete. You’re sure to be playing this one for a long time. 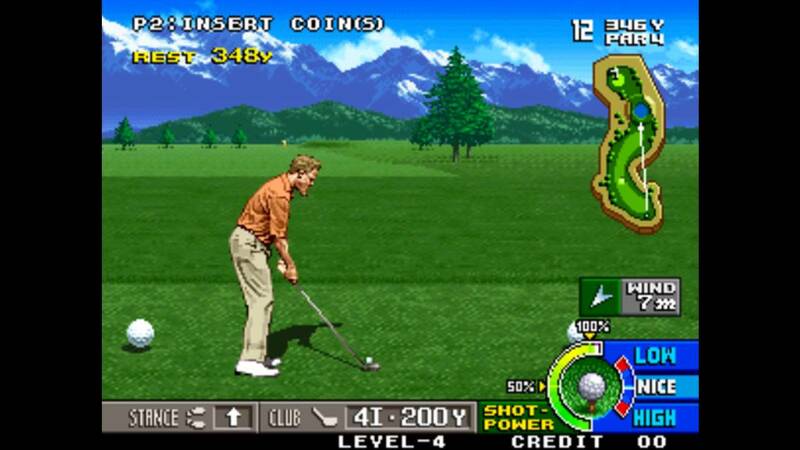 I wasn't actually sure how golf would work as an arcade-like experience. After all, it's a slow, sedate sport, and golf video games aren't exactly known for putting action and excitement into the sport. As it turns out, you make an arcade golf game by demanding players get birdies or better on every hole, or slowly run out of "lives" and be kicked out of the game before they can reach the 19th hole. Then you make those holes truly challenging past the fifth or sixth hole, with trees and water hazards that are particularly difficult to miss; especially when the amount of information the game gives you is limited. Actually measuring the angles of the putting greens, especially, is a nightmare, but aside from the drive (where you'll usually want to hit the ball as hard as you can) calculating the percentage strength of a shot that you need to make the ball land where you want it to is generally the difference between a good player, and one that will find themselves running their credits out quickly. There's four courses to play on, and they're all markedly different, and plenty of different players to choose between. Each of those players has very distinct strengths and weaknesses from one another. The presentation in general is great, and the challenge level is oddly compelling. This is a difficult game to put down.